RT156-115 Class 156 - Set Number 156405 - East Midland Trains Livery. RT156-115 Class 156 - Set Number 156405 - East Midland Trains Livery.This model is a limited edition..
RT156-116 Class 156 - Set Number 156473 - East Midland Trains Livery. RT156-116 Class 156 - Set Number 156473 - East Midland Trains Livery.This highly detailed model is a..
RT156-118 Class 156 - Set Number 156410 - East Midland Trains Livery. RT156-118 Class 156 - Set Number 156410 - East Midland Trains Livery.This model is a limited edition..
RT156-119 Class 156 - Set Number 156406 - East Midland Trains Livery. 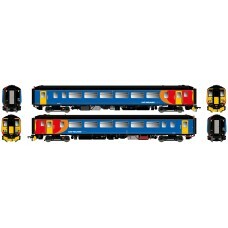 RT156-119 Class 156 - Set Number 156406 - East Midland Trains Livery.This model is a limited e..